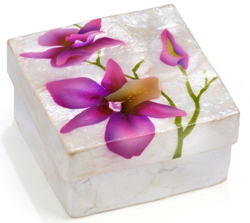 Versatile 3" capiz shell boxes with removable lids can be used for trinkets, candies, keys, paperclips, cosmetics, etc. Designs range from floral to fish, peacocks to pineapples. Sold in batches of 10 (min. 2 per design)--designs can be combined. 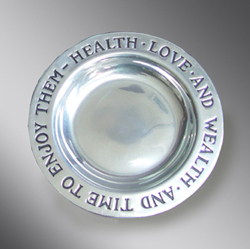 This gift features a classic saying "Health Love and Wealth and Time to Enjoy Them." Measures 9.25" W x 10" L x 1" H. Made of pewter that never needs polishing and can withstand temperatures from oven to freezer. 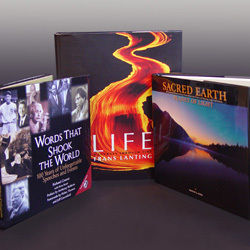 A perfect gift for wellness-related or finance-related industries, house closings, holidays, retirement and weddings. 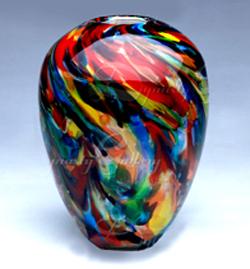 Brushstrokes of colors swirl to a swell in this individually handcrafted glsss vase. Measuring 11" tall, this piece of art is a unique statement of beauty. This elegant display for serving up to six shots or flights of beer, includes six 2-oz. shot cups plus a 7"x12" rectangular tray. Crafted from heavy guage pure copper--100% recycled metal.